Fujifilm’s instax line of instant cameras is full of small yet robust models, each with a few unique features and benefits. Some are more compact, others offer a few more options and modes—and even a selfie mirror. One thing all instax cameras share, however, is a powerful built-in flash. As with other types of photography, proper use of the instax flash can make a major difference in the way your shots turn out. Here are a few tips to help you get the most out of yours! Most instax flashes have an effective range of just under three meters. If you’re shooting in a dark area, subjects within this range will be well-lit, while objects far away may become too dim to see. Similarly, a flash’s light becomes harsher with distance. A broad light source offers softer light, on the other hand, and the closer your subject is to the flash, the broader the flash beam will effectively be. Bottom line – optimise the distance between yourself and your subject to achieve the right balance your shot needs. You’ve got a bit more leeway in a brighter environment with more ambient light, but there is still a range of effects you can achieve in dimly lit settings. Light comes out of a flash in many directions, and you won’t always want all of those beams lighting up your shot. To narrow the beam or block it from one side, you can use a flag—a piece of opaque foam or paper that blocks a part of the flash’s light. When using larger flashes fixed atop bulky cameras, photographers often attach a piece of foam directly to the flash. With the instax, however, you might just hold a dark note card or piece of cloth to one side of your camera, keeping the focus on a specific part of the frame. 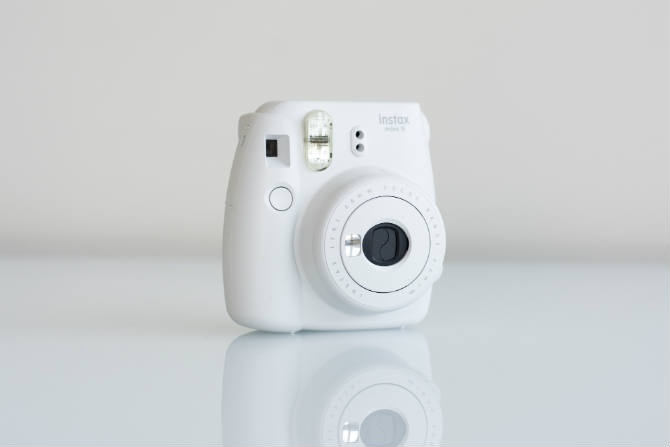 In addition to the flash, the instax line also features several brightness settings: “very sunny”, “sunny”, “cloudy” and “indoors.” These settings affect how much light the camera’s aperture lets in. Brighter settings let in less light, since there’s more ambient light available, while darker settings let in more. Most models automatically detect an optimal setting, but depending upon your environment, subject and mood, the interplay between the flash and brightness setting may not produce the desired effect. If your shots seem too bright, too dark or too washed-out, play with the brightness in addition to the flash. As we mentioned before, the flash can cause harsh lighting at night, particularly if a subject is too far away. What if you can’t adjust your distance, or you need to stand back to capture the scene? Try the hi-key setting, a 5th “brightness” setting that both softens and brightens your pictures. Hi-key tends to wash out daylight photos, but combined with the flash, it can create perfect nighttime shots. You might think of a flash’s light as white, clear or colourless. Like any wave of visible light, however, it does have its own colour. If the colours in your instax photos seem a bit off, try dressing your subjects (or yourself) differently, find a different ambient light source, or wait for a different time of day. Barring those options, you can also do what plenty of studio photographers do—use a filter. A variety of semi-translucent materials will allow you to cast a different-coloured light through your flash, either offsetting the unwanted colouration or producing a cool effect. Useful as flashes are, it’s often tough to get your shots just right with a single, super-bright light source. In fact, some of the best professional photographers prefer to use ambient light when possible. If your flash photos are too washed out or display too high a contrast, try sunnier settings, or play with lamps, shades and overhead lights indoors. If the environment is bright enough, your instax flash’s automatic mode may prevent it from firing at all.